What’s in OPTICS for you? The Advisory Council for Aviation Research and Innovation in Europe (ACARE) Flightpath 2050 has provided Europe a vision for aviation and air transportation, identifying challenging goals for the research community and policy makers alike. To identify a pathway towards the vision, ACARE with a broad cross section of the aviation and air transport industry, developed the Strategic Research and Innovation Agenda (SRIA), a roadmap providing guidance on what is required, when and how. The goals are challenging: ensuring that Europe maintains its competitive edge in the global market through sustainable investment in research and innovation, and assuring that aviation achieves the highest levels of safety and security throughout the whole air transport system. With today’s already excellent safety levels and the new challenges identified by the vision, scarce safety research resources must now be directed towards innovations accommodating the technological evolutions foreseen over the coming decades, while maintaining or even improving the very high levels of safety attained within the aviation sector. Intensive, well orchestrated Research & Innovation are essential. 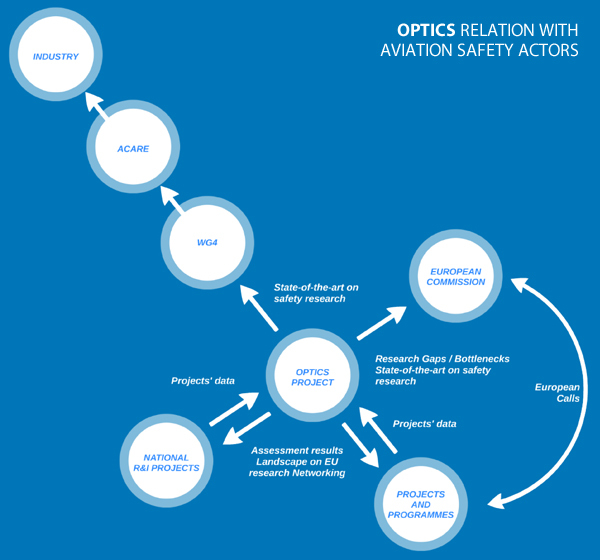 To support this process, OPTICS provides a comprehensive evaluation of relevant safety research and innovation in aviation and air transport, aiming to provide a complete picture of how research and innovation is performing, confirming that the right research is being conducted and that research is delivering the expected benefits to society, drawing conclusions and providing recommendations for consideration by European Commission and other stakeholders as research and innovation progress along the pathway to the vision. © 2013-2017 OPTICS, All Rights Reserved.